"I am well organized, I like things straight and symmetric and in a very certain way." Sounds familiar right? I try to keep the folder structure flat and clean so that I can locate the image with ease. I think the folder names are self explanatory. Beauty: Everything related to a beauty shoot will go in this folder. Fashion: All the images catering to fashion shoots will be archived in this folder. Projects: This is where personal projects go into by there project names. This does not include fashion and beauty projects. Note: The '_1' indicates the first time I worked with that client. This number would increase as the number of times I work with them, i.e., if I do multiple shoots with the same client, the number would increase accordingly. On the left, I did 7 shoots with my client Mèlui. So, the number in the folder title kept increasing as I did a new shoot. The original RAW files are session managed in Capture One, but only the final output folder is imported into Lightroom. You can read the complete blog on Workflow: Import To Export. Advertisements: Advertisement shoots are saved by the brand or client name and product name is appended at the end. Bloggers: This is where the fashion blogger projects are stored by the blogger name. Editorials: This is my favorite folder, Each Editorial for the magazine/publications are archived here by the editorial name. Portfolios: Portfolio, Comp Card, Polaroid shoots for models are archived here by the model name. Tests & Experiments: This is where experimental shoots with a Model go, be it a new type of lighting, new look, new project that I am going to work on. 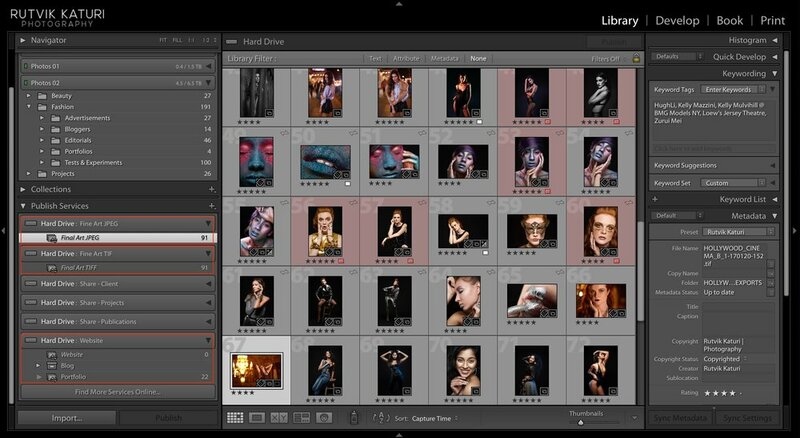 The final edited/retouched images are exported with publish services in Lightroom. To maintain access everywhere I go, I export the JPEG's and TIFF's into dropbox folder and store there permanently which is automatically synchronized to dropbox. This way I have easy access if I want to share with the clients. Final Art JPEG: This collection is configured to export full size JPEG's in a specific location. Final Art TIFF: This is for exporting non-layered TIFF's in a specific location. This also serves as an extra backup. Share - Client: This collection is used for exporting full size JPEG's and are shared with the clients. This is specifically meant for monetizing projects. Share - Projects: Tests & Experiments, Bloggers, Editorials are exported to full size JPEG's and are shared with the team. Share - Publications: Full size JPEG's or TIFF's are exported accordingly and shared with magazines/publications. Website: Web sized JPEG's are exported here which are configured to upload to my website automatically.